No matter what you are trying to market on the internet, you will always need a landing page to point contextual traffic to. The landing page is a hugely important element to internet marketing. Think of the process of marketing something to web users as a line of dominoes. If the last domino, being the landing page, does not fall, then all of the previous effort to that will be futile. The landing page is where the conversion takes place. For this reason, it needs to be well designed in order to achieve a high conversion rate. With this, here are some elements that can make any landing page successful. From doing this, you make sure the web users roughly read the content in the correct order to entice them the most into converting for you. The phrase ‘a picture can tell a thousand words’ is often used based on the effectiveness of what is inside the image. 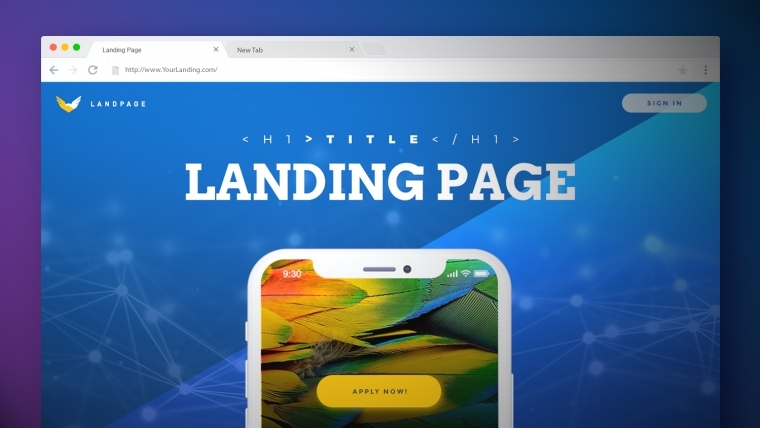 If you use the correct type of image for your landing page, in a central location, the amount of content that is required to entice web users into converting can significantly decrease, helping to improve the chance of web users staying on your landing page for longer. For example, if you was trying to market a new alarm clock, you could have an image of someone waking up happy in a light colored room with the alarm clock, in focus, closest to the camera – this would automatically portray the alarm clock in a positive manner, whilst allowing the web user to use their imagination as to how the alarm clock would look in their home. The image is also able to sell a feeling, as it portrays a feeling of happiness in the morning when buying the product – the web user wants to be the person waking up happy. The rule of three is a list of three bullet points which work to encourage the web user into converting for you. Instead of having heavy content to explain what you are trying to market, you could use three snappy bullet points which outline the main beneficial features of what you are marketing.